It’s time to take control of your health club’s tech strategy. Though this quip probably didn’t cause you to double over in laughter, it successfully expresses the remarkable fact that a string of strategically sequenced ones and zeroes has the power to completely change our lives and transform entire industries. Enduring the inexorable progression of tech disruption is a fact of life for health club owners. Just when you think you figured out where technology is taking the fitness industry, a new digital invention changes the landscape. For instance, Forbes magazine reports that blockchain, that ubiquitous but poorly understood crypto-technology, is poised to shake up the fitness industry. The article warns that a Netflix-like streaming service powered by blockchain could allow trainers and other fitness content creators to forgo brick-and-mortar clubs and directly sell their workout sessions to consumers. You don’t need to understand how these technologies work, but you need to know how they’re going to impact your business. And you have to be open to adopting new tech while avoiding bad investments in unnecessary digital products. The digital world changes fast, and that’s only going to accelerate. Speaking at IHRSA 2017, Al Noshirvani, chairman of Motionsoft, a leading technology and payment processing company in the health, fitness, and wellness markets stressed that any digital strategy shouldn’t be set in stone. “The key takeaway is that club operators need to implement digitally nimble solutions,” notes Noshirvani. “Operators solve very real business challenges while creating ROI. Digitally nimble solutions allow operators to make incremental changes to individuals modules as opposed to wholesale changes to an entire application platform. At the end of the day, your goal is to not have any single solution become a choke point that can stall your business growth, derail your technology strategy or increase your costs,” he says. After founding Motionsoft in 2004, Noshirvani watched the health club industry confront tech disruption with mixed results. “One of the things that our industry didn’t have was a forum where health club and fitness executives could meet on a regular basis to share ideas with their peers and colleagues to see what worked,” says Noshirvani. He decided that there had to be a better way to expand the knowledge base for fitness leaders when it came to technology. Noshirvani hopes that the Motionsoft Technology Summit helps prevent club owners from being intimidated by the growing spectrum of digital platforms. To bring these dynamic digital products together successfully, you have to have what Noshirvani calls a “single source of truth,” a software platform that can leverage multiple third-party apps and integrate them into a club’s data streams. That’s what Motionsoft’s club management software was designed to do: Create a premium member experience while providing payment processing and revenue management in a unitary system. 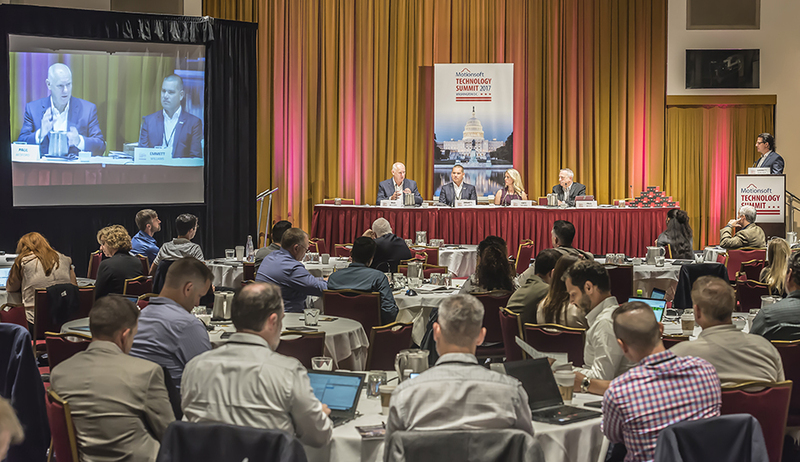 Attendees listen to a panel at the 2017 Motionsoft Technology Summit. Motionsoft’s powerful integrated software is used by some of the biggest brands in the industry, and they recently signed an agreement with Crunch Fitness. One aspect of Motionsoft’s tech capabilities that make them appealing to large chains is their ability to innovate on the fly, responding to the constant changes in today’s digital climate. Utilizing technology to its greatest potential is what drives the annual Motionsoft Technology Summit, and Noshirvani wants the entire industry to benefit. This year the meeting’s keynote speaker is Jim Worthington, the newly-elected chair of the Board of Directors of IHRSA and the owner of the Newtown Athletic Club. Worthington played a crucial role in helping to get the Personal Health Investment Today (PHIT) Act passed by the U.S. House of Representatives. While the PHIT Act may not have a direct link to a technology summit, Noshirvani understands that sometimes the industry’s biggest innovations can happen without any code, binary or otherwise. Visit the 2018 Motionsoft Technology Summit website to learn more about the agenda at this year’s summit. To find out more about Motionsoft and their range of digital products, visit their website and sign up for a software demo. IHRSA Board Member Carrie Kepple explains why she thinks gyms should incorporate fitness-enhancing technology.